"Look, doc, I spent last Tuesday watching fibers on my carpet, and the whole time I was watching my carpet I was worrying that I might vomit. And the whole time I was thinking, 'I'm a grown man, I should know what goes on in my head.' And the more I thought about it, the more I realized I should just blow my brains out and end it all. But as I thought more about blowing my brains out, I started worrying about what that was going to do to my goddamned carpet! Okay? So, that was a good day, doc, and I just want you to give me some pills and let me get on with my life!" When the Academy of Motion Picture Arts and Sciences handed out its annual Oscar nominations last month, Matchstick Men found itself inexplicably shut out. Without a doubt, Ridley Scott's superb comedy-drama-caper deserved several nods, for rarely does a film span so many genres with such seamless ease. And while it may be fitting that a movie about con artists keeps its audience continually surprised, bemused, and suspicious, Scott makes sure the story's emotional core remains honest and relatable throughout. Yes, we enjoy the plot's twists and turns, but it's the characters of Matchstick Men that rivet our attention and make it a terrifically entertaining and memorable film. From the opening frames, Scott draws us into the obsessive-compulsive world of Roy Waller (Nicolas Cage), a small-time swindler who lives in tortured but comfortable solitude in a modest, ranch-style home in suburban L.A. A neat freak to the nth degree whose trusty Windex bottle is seldom out of reach, Roy is a prisoner of his routines, manias, and insecurities. He constantly cleans his immaculate house, pouncing on the tiniest errant crumb, and is so afraid of germs he slips on rubber gloves prior to handling an empty tuna can, which he encases in a fresh Ziploc bag before tossing in the garbage. For Roy, just being himself is an agonizing chore�with facial ticks and hesitant speech patterns hampering his attempts to live normally�but at work, he role-plays, and submerging his character in a foreign guise usually calms his anxieties. Roy and his partner Frank (Sam Rockwell) specialize in phone scams aimed at the gullible elderly, but when one of Roy's phobias almost blows their cover, Frank suggests he seek help for his crippling disorders. Reluctantly, Roy visits Dr. Klein (Bruce Altman), a sympathetic shrink who replaces the prescription drugs Roy accidentally spilled down the drain, but also gets him to open up about his failed marriage and the unborn child he abandoned almost 15 years before. Dr. Klein helps Roy contact his daughter, Angela (Alison Lohman), and arranges a meeting. Although the mechanics of human interaction come awkwardly to Roy, he and the rebellious, live-wire Angela slowly begin to bond, and (shades of L�on�The Professional) she hopes to learn about and participate in his work. As a thank-you to his partner (and former pupil), Roy decides to pursue a big farewell score that should net a hefty enough chunk of change to allow him and Frank to retire. Their mark is the burly and shady Chuck Frechette (Bruce McGill), but Angela's involvement distracts and weakens Roy, making the con more dangerous and messy. Ah, the joys of parenthood. Talent like Ridley Scott's makes film-watching a joy, and his creative eye and flawless sense of timing and rhythm add wonderful texture to Matchstick Men. The use of jump cuts and jagged edits accentuate Roy's condition, while keeping the audience off-kilter. Yet Scott's dazzling technique doesn't overwhelm the movie or prevent viewers from absorbing the nuances of Ted and Nicholas Griffin's clever, wry script. Scott strikes just the right balance, taking his cues from the characters, and achieves a smooth, effortless flow that appeals to fans of both fine filmmaking and storytelling. Over the years, Cage has created a gallery of quirky characters, but Roy stands apart as one of his best portrayals. The actor once again surrenders to his role, and though it would be easy to coast on the showy aspects of Roy's outward infirmities, Cage doesn't neglect the inner turmoil and blossoming emotions that are such an integral part of the film's (and Roy's) subtext. As much fun as it is to watch Scott weave his directorial magic, it's equally entertaining to witness Cage craft moments, and he maximizes countless opportunities in this film. Like DeNiro, Pacino, Streep, and Nicholson, Cage gets tremendous mileage out of a raised eyebrow or wistful smile, and his basset hound eyes add a sadness and sensitivity to Roy that make us identify with and root for him throughout. His interaction with Lohman is especially endearing, and the 24-year-old actress amazingly transforms herself into a young teen. She pouts, cajoles, and manipulates to perfection, while also displaying a soft, vulnerable side that easily seduces Roy and the audience. Rockwell brings tremendous energy to the fast-talking Frank, and his breezy performance belies his character's complexities. 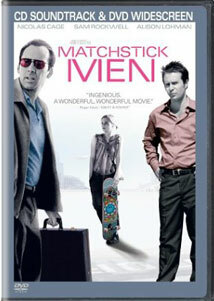 Matchstick Men succeeds on multiple levels, juggling cons and neuroses with simple human relationships and frailties. Its vivid characters supply a sturdy framework for the engaging story, which masterfully strings us along and keeps us guessing right up until the end. Touching and entertaining, visually creative and brilliantly acted, Matchstick Men celebrates the artistry of Scott and Cage, and ranks up there with the best films of 2003. Image Transfer Review: A film about an obsessive-compulsive neat freak demands a crisp, spotless transfer and Warner delivers in spades with an antiseptically clean anamorphic print distinguished by sharp lines, lush colors, and rich black levels. Contrast and shadow detail are excellent, and such tricky elements as Venetian blinds and rippling pool water never shimmer or break down. While this may not be a perfect transfer, it's darn close, and no imperfections ever distract from the utterly absorbing action on screen. Audio Transfer Review: The DD 5.1 track also earns high marks for its subtle but distinct use of multi-channel sound. Ambient effects quietly dance across the front speakers, while Hans Zimmer's creative and complementary score envelops with ease. Dialogue is always clear and easy to understand, and the soundtrack works hand-in-hand with the rapid-fire edits to produce an exciting and involving audio experience. Extras Review: A couple of noteworthy extras enhance the DVD release of Matchstick Men, the first of which is an engaging and interesting audio commentary. Director Ridley Scott and writers Ted and Nicholas Griffin recorded their comments separately, but their remarks nicely dovetail and provide contrasting perspectives and styles. Scott begins by comparing the set-up of a con to the construction of a film unit, and how he originally envisioned Matchstick Men as an "elegant comedy." He discusses how the writers "cleverly sustain sympathy for the protagonists as well as the victims" and addresses the unique challenges of filming an intimate, human story, and how it's far more difficult than a grand epic like his Oscar-winning Gladiator. Scott also offers up a mini filmmaking seminar by outlining the differences between spherical and anamorphic lenses. His comments are always serious, pointed, and insightful, yet presented in an easygoing, conversational style. The Griffins, on the other hand, nicely balance Scott's gravity by providing comic relief, talking about their own neuroses and ribbing each other about their foibles. At times a bit goofy, but always entertaining, the brothers still manage to impart a wealth of interesting information and anecdotes. The other supplement is an often fascinating three-part documentary that can be played in individual segments or continuously. Entitled Tricks of the Trade: Making Matchstick Men, the nearly 75-minute film employs a day-by-day diary format to chronicle almost every aspect of production. Anyone intrigued by the nuts and bolts of filmmaking will find this finely crafted, informative film riveting. Part One: Pre-Production reviews the casting process, costume tests, and location scouting, and features interviews with various personnel. Like a reality TV show, the participants are blissfully unaware of the camera (most of the time), allowing viewers unfettered access to the creative process. We see how the wheels are always turning in Cage's mind, as he adds bits and layers to his character during wardrobe fittings, and then tag along on a "tech scout," in which Scott and his crew tour all the film's locations in a single day and outline various shots. Part Two: Production begins bright and early at 6:32 a.m. on the inaugural day of filming. A sleepy Scott emerges from his car and gripes, "Jesus Christ, we're being filmed already!" A little over an hour later, shooting begins in earnest, and we're treated to plenty of raw footage from various scenes. We see Scott relating to the actors and crew, and witness his explosion of temper when a camera jam ruins a particularly fine take. Producer Steve Starkey talks about the impact of 9/11 and how security concerns now prohibit Hollywood film crews from working in airports. As a result, the Anaheim Convention Center was transformed into LAX with amazingly accurate results. Other noteworthy events include author Eric Garcia (who wrote the novel Matchstick Men) visiting the set and offering his impressions; safety issues concerning an audio technician who wants to be stationed in a car trunk during an auto chase; and Alison Lohman's birthday celebration. Part Three: Post-Production begins at the director's cut screening and features in-depth segments on the scoring and editing processes. It's here that we're shown a few snippets of deleted scenes and hear the rationale behind their excision. We watch the nervous production crew endure the initial test screening, then view the resulting reshoot of the ending, which featured the addition of a mere three lines of dialogue. Clips from the film's premiere at the Toronto International Film Festival are also included, as well as a brief look at a couple of alternate endings. The copy of Matchstick Men reviewed here tosses in the film's CD soundtrack as a bonus. Although it features only one real vocal track, it's a surefire winner�The Good Life, sung by the incomparable Bobby Darin. Herb Alpert & The Tijuana Brass and Mantovani & His Orchestra also contribute instrumental selections. Hans Zimmer's score beautifully enhances the movie, but on its own can be rather repetitive and dull. A film-only disc (in both widescreen and fullscreen versions) is also available for about $10 less. The talented Mr. Ridley Scott scores again with this marvelous, richly textured film that cinema buffs, acting aficionados, and those who just love a damn good story will want to play over and over again. Nicolas Cage files one of the year's finest performances, and Sam Rockwell and Alison Lohman make notable impressions. Warner's exceptional transfer and intelligent extras top off this delicious confection, which earns our highest recommendation. And that's no con.